Selmsdorf/Lüdenscheid, October 2013 – FOBA Laser Marking + Engraving introduces a new UV laser marker, FOBA V.0020-uv, for the high-contrast laser marking of various plastics and highly sensitive products and materials. FOBA‘s ultraviolet marking laser V.0020-uv achieves high-contrast marks on various plastics and highly sensitive products and substrates. The energy of the shortwave ultraviolet laser light (355 nm) causes a photochemical reaction on the processed product. The product surface is altered with very little heat dissipation – a process referred to as cold marking. Thanks to this minimal heat input during marking also highly sensitive products and materials can be marked almost damage-free and with high contrast. This makes FOBA‘s UV laser marker V.0020-uv an optimal solution for marking products such as aircraft cables, translucent or colored tubes used in various industries, medical plastics for invasive applications, flame-resistant plastics for electronic housings or glass. FOBA V.0020-uv alters the product surface photochemically (instead of foaming the material) so that the product remains essentially unharmed. 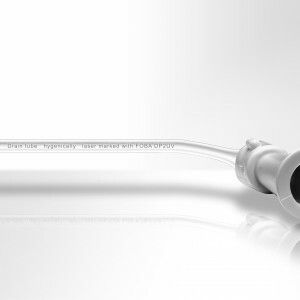 This is how permanent laser marks, resistant to typical sterilization processes, can be achieved on medical devices such as catheters or insulin pumps, and this is also how filigree and brilliant laser marks can be applied on glass without breaking the glass. With V.0020-uv previously not damage-free markable materials such silicones or white polyamides can now be laser marked and stay undamaged. 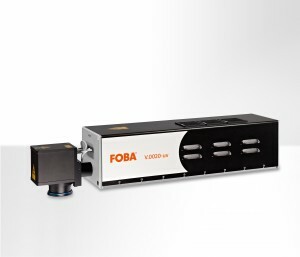 Thanks to the use of long-lasting optical components and an efficient air-cooled design, FOBA V.0020-uv is a low-maintenance and economic marking laser. The possibility of marking products solvent-free and without additives makes FOBA‘s UV laser marker an eco-friendly and consumable-free marking solution.